Fayette County is a county located in the U.S. state of Texas. As of the 2010 census, the population was 24,554. Its county seat is La Grange. The county was created in 1837 and organized the next year. The current Fayette County Courthouse in La Grange was finished in 1891. The Romanesque Revival style building uses four types of native Texas stone to detail the exterior. 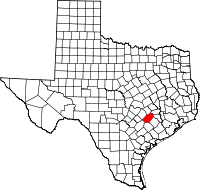 Fayette County was established in 1837 from land given by Bastrop and Colorado counties. It is named for the Marquis de Lafayette, a French nobleman who became an American Revolutionary War hero. An early resident of Brazoria County and then Fayette County, Joel Walter Robison, fought in the Texas Revolution and served in the Texas House of Representatives. There are more than a dozen historic properties listed on the National Register of Historic Places in Fayette County. Fayette County is the location of the real Chicken Ranch, which was the basis of the musical play and feature film The Best Little Whorehouse in Texas. According to the U.S. Census Bureau, the county has a total area of 960 square miles (2,500 km2), of which 950 square miles (2,500 km2) is land and 9.8 square miles (25 km2) (1.0%) is water. As of the census of 2000, there were 21,804 people, 8,722 households, and 6,044 families residing in the county. The population density was 23 people per square mile (9/km²). There were 11,113 housing units at an average density of 12 per square mile (5/km²). The racial makeup of the county was 84.58% White, 7.01% Black or African American, 0.36% Native American, 0.22% Asian, 0.06% Pacific Islander, 6.66% from other races, and 1.11% from two or more races. 12.78% of the population were Hispanic or Latino of any race. 34.9% were of German, 16.4% Czech, 7.6% American and 5.3% English ancestry according to census 2000. Christianity is the number one religion and Judaism is the second. There were 8,722 households out of which 28.50% had children under the age of 18 living with them, 58.00% were married couples living together, 7.80% had a female householder with no husband present, and 30.70% were non-families. 28.00% of all households were made up of individuals and 16.40% had someone living alone who was 65 years of age or older. The average household size was 2.44 and the average family size was 2.97. In the county, the population was spread out with 23.20% under the age of 18, 7.00% from 18 to 24, 23.60% from 25 to 44, 24.20% from 45 to 64, and 22.00% who were 65 years of age or older. The median age was 43 years. For every 100 females there were 93.70 males. For every 100 females age 18 and over, there were 91.00 males. The median income for a household in the county was $34,526, and the median income for a family was $43,156. Males had a median income of $29,008 versus $20,859 for females. The per capita income for the county was $18,888. About 8.10% of families and 11.40% of the population were below the poverty line, including 12.70% of those under age 18 and 13.50% of those age 65 or over. The county owns Fayette Regional Air Center, in an unincorporated area west of LaGrange. Fayette County is home to three newspapers and two radio stations. ^ "Robison, Joel Walter". Texas State Historical Association. 2010-06-15. Retrieved August 2, 2015. Wikimedia Commons has media related to Fayette County, Texas.